Publisher's Note: Cardboard Hero is the companion story to Wild Geese -- the story of the author writing Wild Geese. She knew her quarry. She'd seen him once, from across the market square, in Inverness, it was. Three years ago now, almost four. A giant of a man. Nearly two ells tall and nigh thirteen stone, she'd wager. Long, slightly curling dark hair escaped to frame his face in a wild fray that sang of the Highlands. Shoulders broad and powerful enough to swing that claymore as if 'twere no more than a wee dagger. What she remembered most were his eyes. Bright, shining green eyes that brooked no quarter even when he'd been surrounded and pushed back towards the water's edge. He'd fought them still, fought until every last man lay dead and he alone stood to wipe the blood from his blade. Aye, he was a killer, that one. He'd gotten away, but at what cost? Six men down, good men, and none to pay for their loss. Wives and sisters and daughters left with their crosses to bear. And all so Bonny Prince Tearlach could sit in his borrowed castle half a continent away, sipping red wine, or strolling the gardens playing croquet. The Highlanders were fools, the lot of them, her husband included. And it fell on her now to avenge him as he'd splayed himself on a dead man's blade. Aye. Well, there was nothing else to it. She'd best get on with it, then. 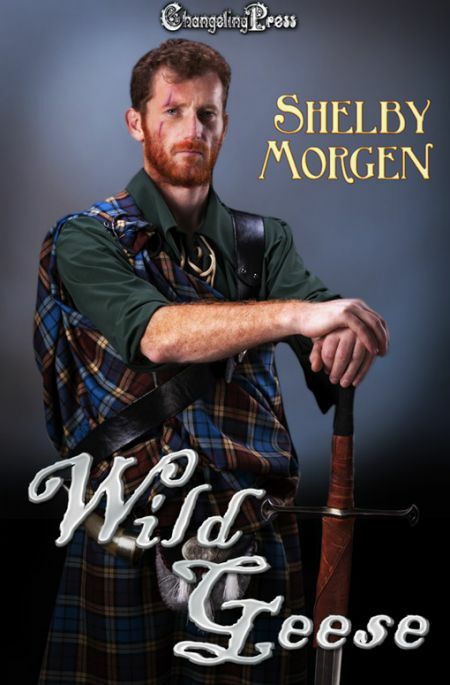 She'd fought him once, in her dreams, defended her honor and that of her clan. She'd taken up her husband's sword, still slick with his own blood, and charged into the fray. She'd woken up damp and winded, her muscles still twitching as she raised her arms to bring the sword crashing down on his head. She hated. Oh, how she hated. That frightened her more than the man. For what was a man, but so much clay? But hate, that would live on until it consumed all in its path. What would she be when naught else survived but her hatred? It mattered not. Regret was for those with a future. She had none. She had naught but a debt that must be repaid, and a man with a price on his head whose blood would settle the debt. For tonight, she had kinsmen to go to who would give her what she needed most. A way to locate the elusive Gray Ghost. Afterward, perhaps, she would have time to mourn. But not now. Definitely not now. She fingered the small bloodstained patch of tartan with which she'd wiped the last drops of blood from her husband's dying lips. No. Not now. She would wait. A woman had to be good at waiting. A woman was always waiting on something, wasn't she? No matter. Regret was a dish best served cold, and today's meal was a far sweeter one -- revenge soaked in the fresh, hot blood that would spill from the man's heart when she sank her dirk in to the hilt. She was a fast ship, the Anice, a square-rigged schooner built to ride the winds. Soon the Western Isles would be but a memory, a picture he'd hold forever in his heart. They'd one more landfall to make before Eire -- MacDonald's of Glengarry. Then he would rest. The early hours before dawn found him ashore, leaning heavily against the low stone wall, closing his eyes for just a moment while he waited. He wouldn't go to sleep. He couldn't. Didn't have time. Couldn't afford the luxury. But he could afford to close his eyes for a moment. Just a moment. A sliver of sound reached his ears. He jerked awake with a start, his heart beating wildly. What? There it was again, the faintest of tinkling laughter, like the tiniest ring of a Faerie bell. Changeling! He could almost hear his grandmother's warning hiss against the quiet of the night. He searched the darkness, but he could not find the source of the magical Faerie laughter. Ewan shook his head, trying to rid himself of the ridiculous superstition. Changeling indeed. He needed no spirits for haunts. Cumberland's whole damnable army was most likely after him. His capture would not be enough. Not any more. Cumberland wanted him dead. He'd lived with a price on his head for almost four years now. The wanted posters and broadsides called him the Gray Ghost. Untraceable. Unstoppable. Made him out to be some sort of a monster. Or a hero, depending on who was telling the story. He knew better, either way. Heroes were soon enough martyrs. He was just a Highlander, an exile in his own home, surviving the best he could. If he helped some along the way, 'twas a debt he owed, and he was one to repay his debts. He was a careful man, a cautious man, one who knew the firths and the bays of his native land as well as he might have known his own daughter's face, had she lived. He could smell the tides when they changed and read the danger in a man's face before he reached for his dirk. He provided a service to those in need, and he took his reward where he might. Still, the Changeling's laughter gave him pause, made him remember the softer things in life he'd once taken for granted. He couldn't recall the last time he'd bathed in the cool, clean water of a highland spring, or slept 'neath the clear, crisp skies, the smell of the heather a sweet drug to his senses, the sound of the wind his lullaby. Hell. He couldn't remember the last time he'd slept. Sleep brought no sweet release for him. Not anymore. No matter. There was work to be done, and the night was the time for doing it.